Will work for carrots. Need a website? Logo? Campaign? Horses love carrots. And, I find myself going through bags of carrots rather quickly these days. Yes, I’ll fully admit that I’ve created a treat monster. That said, the yellow pony needs his carrots. Let’s talk about your project. Introducing Wasatch Chimney. This is such a fun business to brand. We designed the logo, and built the site and the process was so much fun. Super awesome client who wants to build his brand. We wrote some great copy to set Wasatch Chimney apart from the competition. At Wasatch Chimney, we believe there is a better way to serve our customers. A more valuable, less invasive way where customers are earned rather than bought. We're obsessively passionate about what we do, and our mission is to serve people. ADDITIONALLY, we believe passionately in travel, an honest day’s work, great friends, broadened horizons + a spirit of adventure. Introducing Wasatch Chimney. Your local chimney and fireplace specialists. I’m lucky enough to collaborate with this awesome new client and their new business. Here’s the logo I designed for them. Stay tuned, more to come. This is an inspiring client! We’ve been working with technology clients since the 90’s. Brand like Intel, Microsoft and Iomega. Simply put, we get technology. And although we’ve worked with the big boys, our real passion is working with tech startups. We help growing startups that need expert design and marketing without the drag and overhead of a full-time ad agency. Hit us up if you’ve got a startup with little to no marketing budget and see what we can do for you. I saw this display today at the store and stopped to take another look. I think Idaho does a pretty good job of branding their potatoes. I found this nifty infographic on the Idaho Potato Commission’s site, and learned that 9 of 10 people associate Idaho with potatoes, and that 72% of Americans are inclined to eat potatoes from Idaho. Good job potato guys. DIY tip. There’s an entire world of Photoshop Actions out there that allow you to create effects that would typically be reserved for a photoshop guru. Here’s an action that adds a painterly effect to you image. It’s as easy as loading the action, selecting the image and pressing play. Voila. The action does all the work. The top image is the original, and the bottom image has the action applied. Take a look at this effect, available here. Diamond Residential Mortgage Corporation (DRMC) has been in the mortgage industry for over 30 years. Built on a foundation of common sense, integrity, and excellence within a “can-do” environment, their loan officers have the knowledge and expertise to get it done. I’ve been building out a range of digital/collateral materials on their range of products/loan solutions. Learn more. 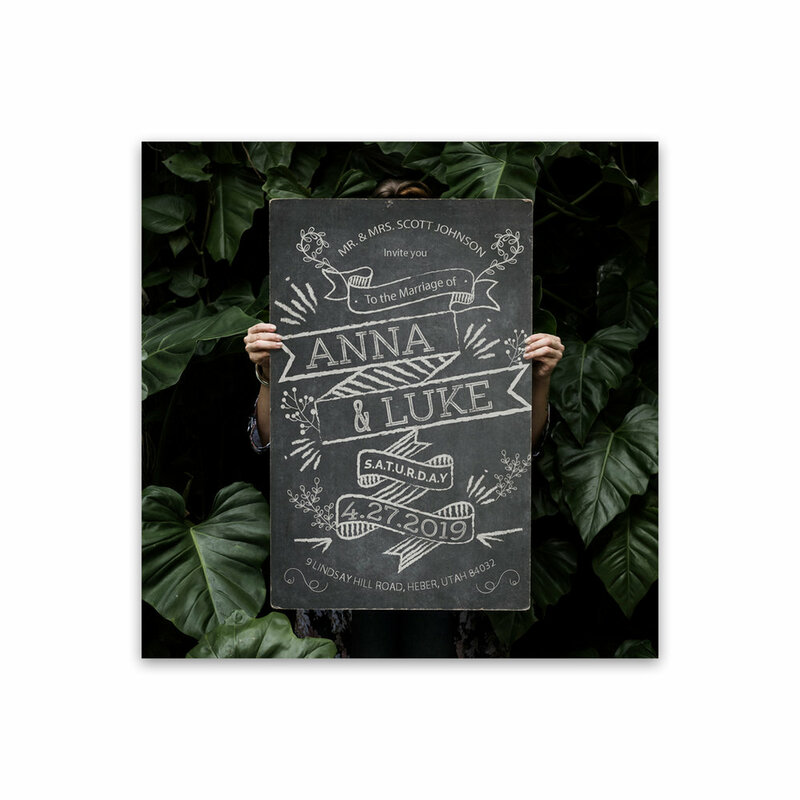 Anna and Luke want a rustic themed wedding. They plan to have wedding signage and decor drawn by a local artist. We created a chalkboard wedding invite to tie into their overall theme. Congratulations you guys!